Happy & Healthy Product franchise business opportunity. Free Happy & Healthy Product business franchise information. Ranked #1 Franchise by Entrepreneur Magazine’s 2006 Franchise 500 in Miscellaneous Food Businesses! Flexible Hours – set your own schedule! A Fruitfull franchise is primarily a wholesale distribution business. 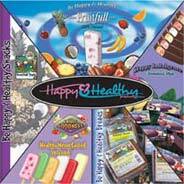 Happy & Healthy Products, Inc. is a national company that distributes the delicious Fruitfull frozen fruit bar as well as smoothies and other high quality products, and we are searching for distributors of our fine products, which would enable you to become part of the Multi-Billion Dollar ice cream industry. The business is almost always managed right out of your home on a part-time or full-time basis, with no retail location to manage and support! In addition, it is a business that you can get all the members of your family happily involved in! Happy & Healthy Product's own marketing consultants spend a full week training you in your immediate area, and they physically go out and set up your initial locations (15-20 minimum to start at Standard level.) Perhaps the most FUN aspect of the business is Retail Sales! This is where you put on your most fun-looking, tropical clothing to sell direct to the consumers at various special events, such as craft shows, fairs and carnivals! One of Entrepreneur’s 2005 Be Your Own Boss 1188 Businesses You Can Start Now! Solid Florida Parent Company formed in 1991 with a proven system that works! On-going Support – In business for yourself not by yourself! To learn more about the Happy & Healthy Product food franchise opportunity, simply complete the form below.